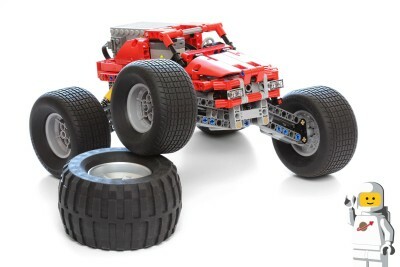 A few years ago I created a modification to the 42005 Monster Truck set, where I motorized it and made it RC (IR), but tried to keep the geometry as close to the original set as possible (see topic here). 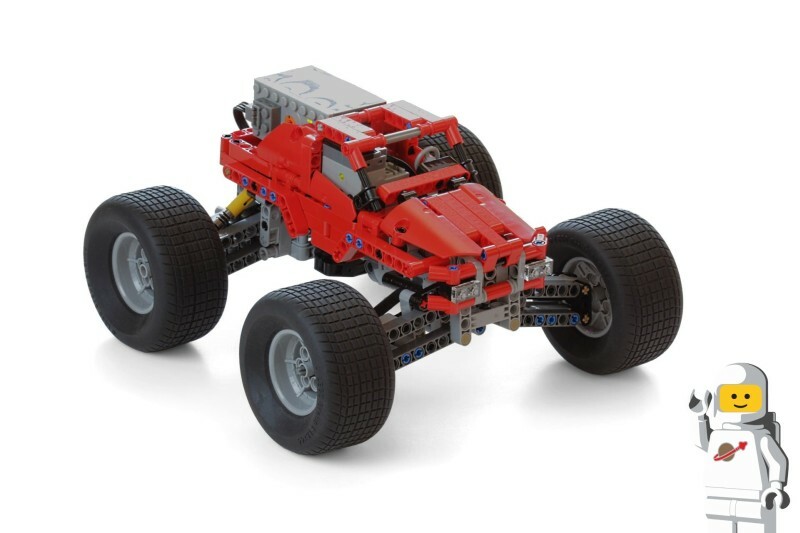 I always liked the design and size of the body of this truck, so I have used it again, but this time I have completely removed the chassis and the drivetrain, and inserted a new one. and a Power Functions Servo Motor (88004) for steering. The truck is controlled remotely using Bluetooth via the SBrick and SBrick Android App on my mobile phone. and positive caster steering geometry. 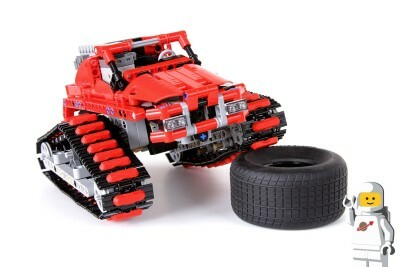 The tires (56908c03) are the tires that were first seen in the Batman Tumbler set (76023). 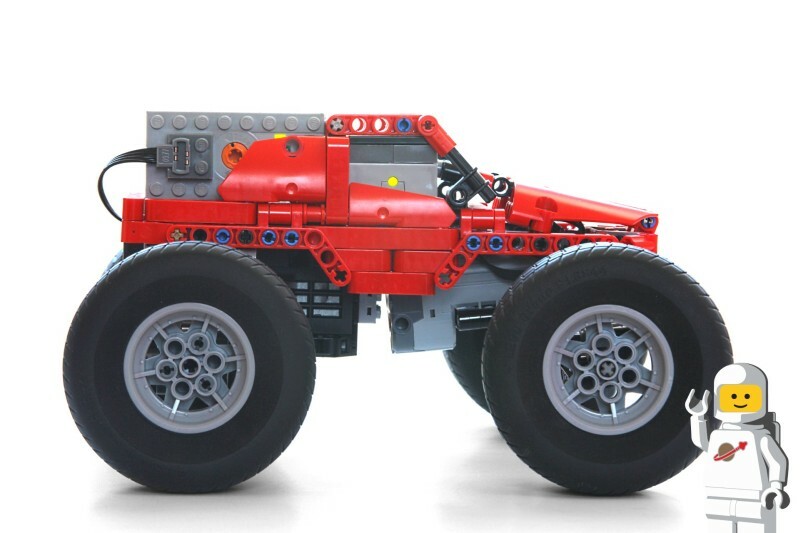 Even though the wheels are so far apart the truck has a short wheelbase, and thanks to the Ackermann steering geometry and differential in the rear it has a fairly tight turning circle. 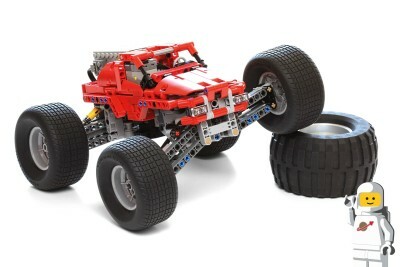 The front suspension uses a single shock absorber (731c05) with a setup similar to the 8081 Extreme Cruiser set from 2011. 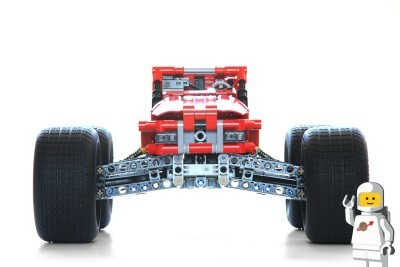 The rear independent suspension uses two hard shock absorbers (731c04), one each side. 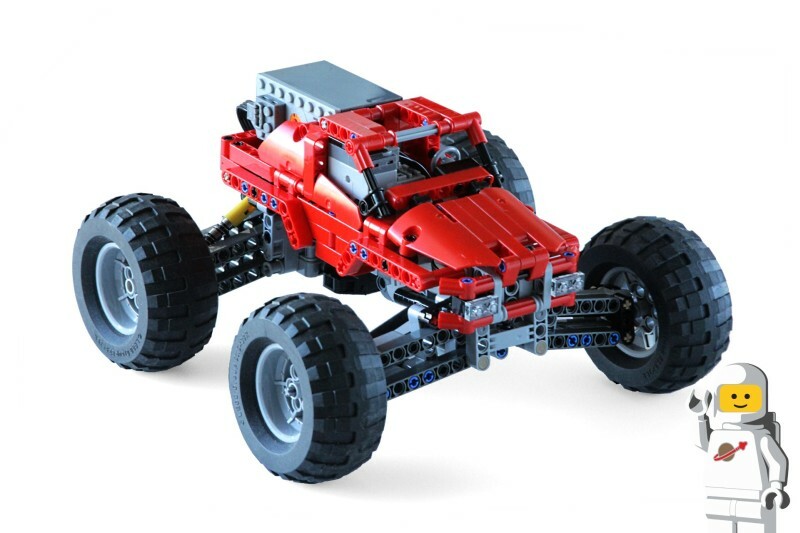 Although the Monster truck uses a Buggy Motor, I couldn't give it full power without the battery and/or SBrick cutting power to it. I could only go at about 70% of max speed. I didn't have much space for gear reduction (apart from a 20-tooth gear to 28-tooth differential), so the output doesn't have much torque when using such large tires. Because of this, the truck takes a while to get to full speed, and slows down when hitting an incline or going off-road, which kind of makes the large suspension travel a bit pointless. I might see if I can gear it down some time in the future. I still continue to have a lot of trouble with the SBrick too. I finally have a version of the SBrick Android App that seems to work ok, but despite being only a few feet away and with nothing else around to interfere with it, it would still lose connection with my SBrick regularly. Hopefully BuWizz will be better, and be able to power the Buggy Motor better too. Any constructive feedback/comments/questions are welcome. So it is basically a square! 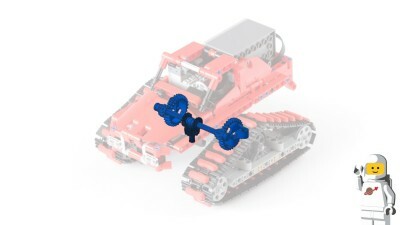 22.5 studs wide (axle track). So it is wider than it is long. It was supposed to look more like an RC Stadium Truck rather than anything that you would normally see on the road. I took off the 'Tumbler' tires, and put the original balloon tires back on. I also changed the drive ratio: I removed the differential, and am now using a worm gear and 24-tooth gear to drive the rear wheels. Love this build... The looks of v1 are better, but obviously v2 performs way better... Well done...!!! 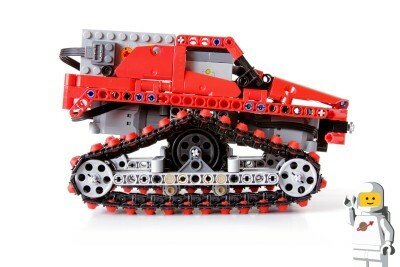 Since this truck uses tank treads with rubber attachments it can traverse a wide range of terrains, and it has neutral steering (it can turn on the spot). 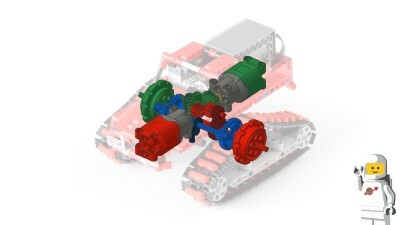 The two bogies are linked via gears to provide suspension. When the left bogie goes up, the right bogie goes down, and vice-versa. The truck itself maintains the average pitch of both of the bogies. No springs are used in the suspension. 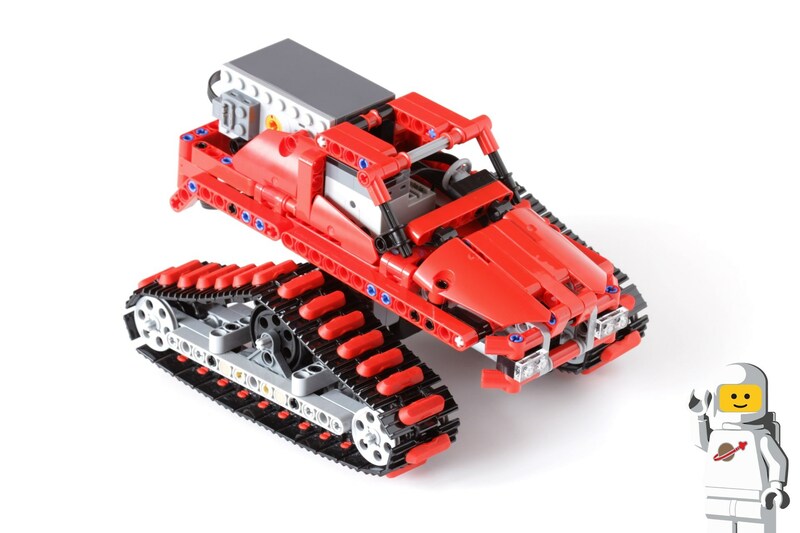 This truck uses the Lego Power Functions Rechargeable Battery (8878) to power an SBrick, which controls two Power Functions L-Motors (88003). One motor drives the left bogie, the other drives the right bogie. 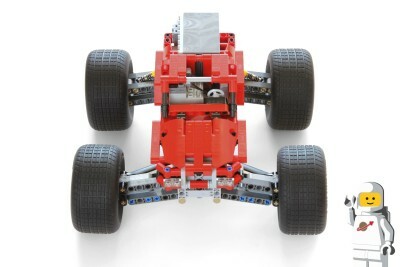 The truck is controlled remotely using Bluetooth via the SBrick and SBrick Android App on my mobile phone. @Splat, OMG! I was getting prepared my version of 42005 MOD this morning (4WD/4WS, but with no "articulated" axles), but your just killed my with your another genius creation. 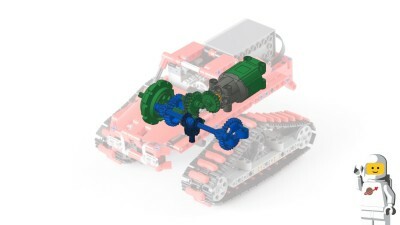 I really love how you made the suspension and how those long axles (blue colored at your technical draw above) works like a kind of torsion shafts complimentary to this "synchronized boggy". 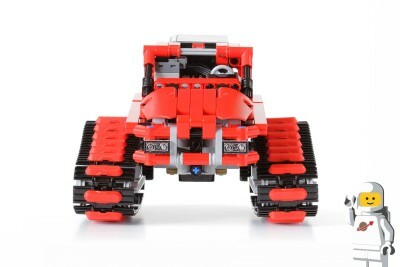 And these red tread attaches, they looks just great! All of these are great, but the tracked version is particularly interesting. Do you have instructions? 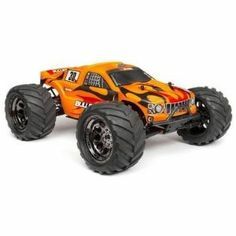 I know that my MOD of 42005 with 4WD/4WS/RC isn't very realistic, so I'd like to see your version of 42005 with 4WD and 4WS if you get around to making it. Sorry, I don't have any instructions for this MOD. I actually made this MOD a while ago and only just got around to posting it now, but I have disassembled the MOD already so I only have the images/video shown above. Hm, a tracked version is very interesting and original! @Void_S - Thanks for sharing. I have left a comment in your topic. I have one more MOD that I want to make to 42005, but it might not be ready for a little while.